is the sequel to The Expected One which pleasantly surprised me last year. In what is now the popular genre of religio-historical mysteries in the vein of Dan Brown’s The Da Vinci Code, McGowan’s series explores the myth of Mary Magdalene and her descendants, the Expected Ones, whose mission it is to preserve and minister her teachings. Compared to a lot of the books in this genre, McGowan’s novels are well researched and written in an engaging manner. She focuses on historical women who have had to endure and battle against the stringent rules of society and the Church in order to protect what was most important to them. Although the revelations are nothing new if you’ve read widely in this area, nevertheless, McGowan’s ideas are slightly different and much more original than that of some of her peers. 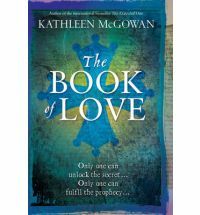 In The Book of Love, the protagonist Maureen Paschal is in search of The Book of Love which contains the teachings of Jesus Christ as narrated to Mary Magdalene. This book was revered by the Cathars and can only be read by the Expected Ones; in other words, women, which highlights the important place of women in Jesus’ ministry. This is something which has been supressed by the Church throughout history and there are people who would do anything to make sure Maureen doesn’t succeed in her quest. McGowan ties this in with the story of Matilda of Tuscany, a possible ancestor of Michelangelo, who dedicates her life to this quest in the 11th century. I’m submitting this for the Thriller and Suspense Challenge 2010. I wasn’t a fan of The Da Vinci Code, but the theme IS interesting, and you make it sound much better than just a cash in imitation.